This U.S. House of Representative Thaddeus Stevens history mug is one of a collection of U.S. Governance biographical mugs. An image of Thaddeus Stevens and a short biography are features of this history mug. 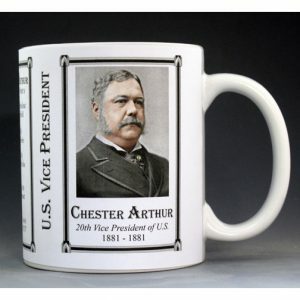 This U.S. Vice President Chester A. Arthur History Mug is one of a complete collection of U.S. Presidential biographical mugs. An image of Chester A. Arthur and a short biography are features of this history mug. This Louisa May Alcott mug is part of our collection of Civil War biographical mugs. 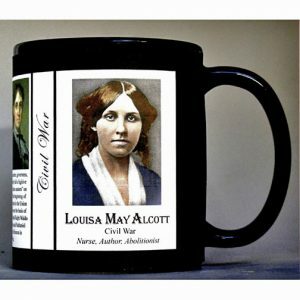 An image of Louisa May Alcott and a short biography are features of this history mug. The Aaron Anderson mug is part of a biographical series profiling unique individuals and includes an image of Aaron Anderson and a short biography. This Andersonville Prison – Camp Sumter mug is part of our collection of Civil War biographical mugs. An image of Andersonville Prison – Camp Sumter and a short biography are features of this history mug. 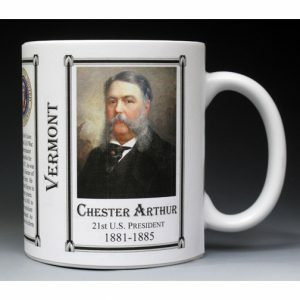 The Chester A. Arthur mug is part of a biographical series profiling unique individuals who shaped the history of Vermont. An image of Chester A. Arthur and a short biography are features of this history mug. 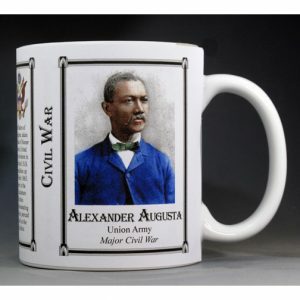 This Alexander Augusta mug is part of a collection of African American biographical mugs. An image of Alexander Augusta and a short biography are features of this history mug. 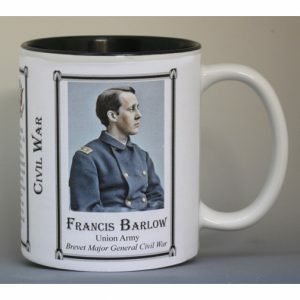 This Francis Barlow mug is part of our collection of Civil War biographical mugs. An image of Francis Barlow and a short biography are features of this history mug. This Clara Barton mug is part of our collection of Civil War biographical mugs. An image of Clara Barton and a short biography are features of this history mug. The Powhatan Beaty mug is part of a biographical series profiling unique individuals and includes an image of Powhatan Beaty and a short biography. 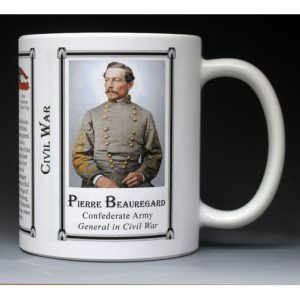 This Pierre Beauregard mug is part of our collection of Civil War biographical mugs. 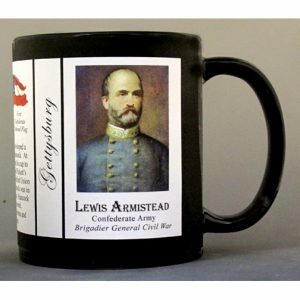 An image of Pierre Beauregard and a short biography are features of this history mug. This Judah Benjamin mug is part of our collection of Civil War biographical mugs. An image of Judah Benjamin and a short biography are features of this history mug. This Mary Bickerdyke mug is part of our collection of Civil War biographical mugs. An image of Mary Bickerdyke and a short biography are features of this history mug. The Gardner Blodgett mug is part of a biographical series profiling unique individuals who shaped the history of Vermont. An image of Gardner Blodgett and a short biography are features of this history mug. 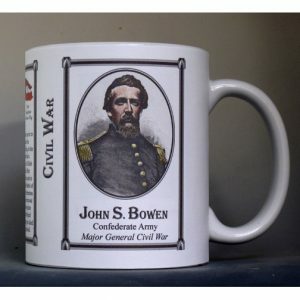 This John Bowen mug is part of our collection of Civil War biographical mugs. An image of John Bowen and a short biography are features of this history mug. This Mathew Brady mug is part of our collection of Civil War biographical mugs. An image of Mathew Brady and a short biography are features of this history mug. 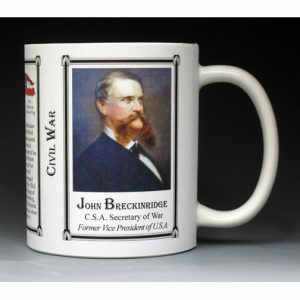 This John Breckinridge mug is part of our collection of Civil War biographical mugs. An image of John Breckinridge and a short biography are features of this history mug. This John C. Breckinridge mug is part of our collection of Civil War biographical mugs. 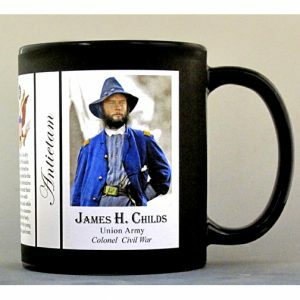 An image of John C. Breckinridge and a short biography are features of this history mug. This Henry Box Brown mug is part of a collection of our Civil War and African American biographical mugs. An image of Henry Box Brown and a short biography are features of this history mug. This John Brown mug is part of our collection of Civil War biographical mugs. An image of John Brown and a short biography are features of this history mug. 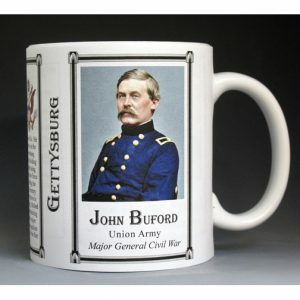 This John Buford mug is part of our collection of Civil War biographical mugs. An image of John Buford and a short biography are features of this history mug. 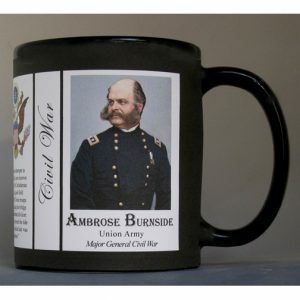 This Ambrose Burnside mug is part of our collection of Civil War biographical mugs. An image of Ambrose Burnside and a short biography are features of this history mug. 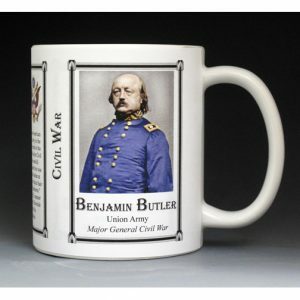 This Benjamin Butler mug is part of our collection of Civil War biographical mugs. An image of Benjamin Butler and a short biography are features of this history mug. 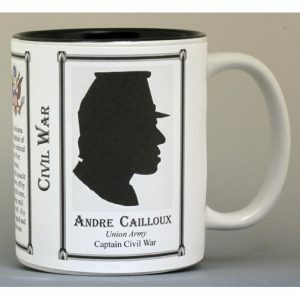 This John Caldwell mug is part of our collection of Civil War biographical mugs. 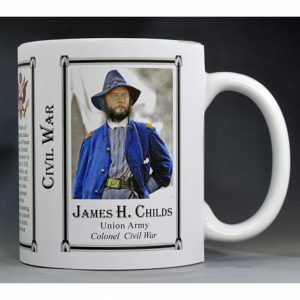 An image of John Caldwell and a short biography are features of this history mug. 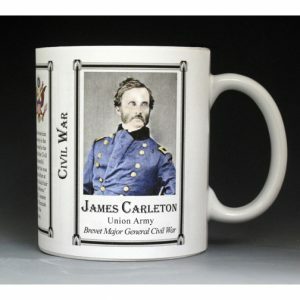 This James Carleton mug is part of our collection of Civil War biographical mugs. An image of James Carleton and a short biography are features of this history mug. 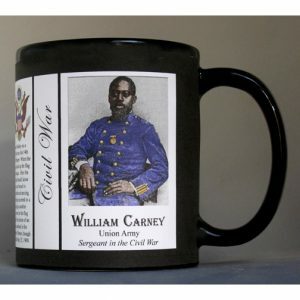 The William Carney mug is part of a biographical series profiling unique individuals and includes an image of William Carney and a short biography. The Kit Carson mug is part of a biographical series profiling unique athletes in a variety of arenas from baseball to rodeo. 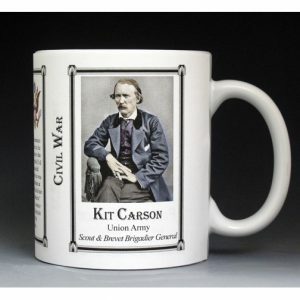 An image of Kit Carson and a short biography are features of this history mug. 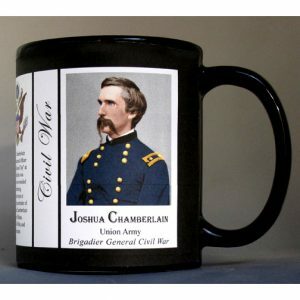 This Joshua Chamberlain mug is part of our collection of Civil War biographical mugs. 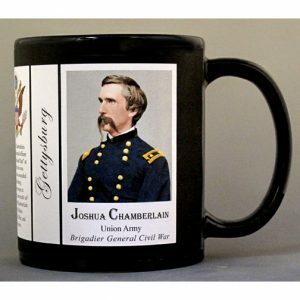 An image of Joshua Chamberlain and a short biography are features of this history mug. This Salmon Chase mug is part of our collection of Civil War biographical mugs. An image of Salmon Chase and a short biography are features of this history mug. This Frances Clayton mug is part of our collection of Civil War biographical mugs. An image of Frances Clayton and a short biography are features of this history mug. This Schuyler Colfax mug is part of our collection of Civil War biographical mugs. 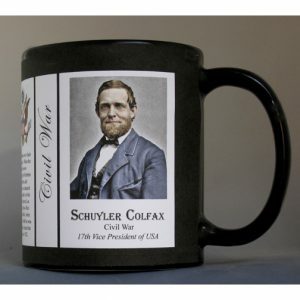 An image of Schuyler Colfax and a short biography are features of this history mug. 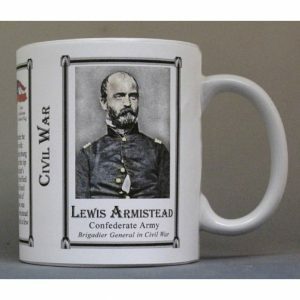 This Lewis Grant mug is part of our collection of Civil War biographical mugs. An image of Lewis Grant and a short biography are features of this history mug. 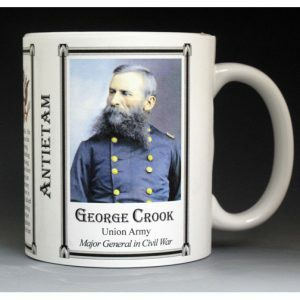 This George Crook mug is part of our collection of Civil War biographical mugs. An image of George Crook and a short biography are features of this history mug. This John Wesley Culp mug is part of our collection of Civil War biographical mugs. 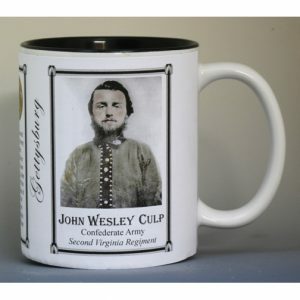 An image of John Wesley Culp and a short biography are features of this history mug. 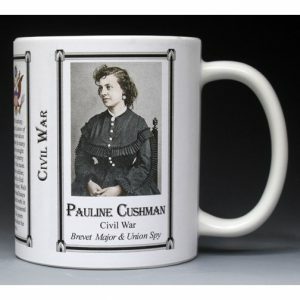 This Pauline Cushman mug is part of our collection of Civil War biographical mugs. An image of Pauline Cushman and a short biography are features of this history mug. 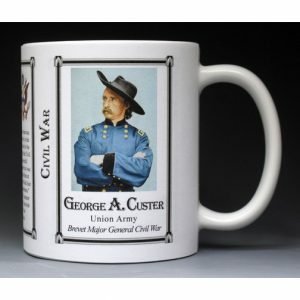 This George Armstrong Custer mug is part of our collection of Civil War biographical mugs. An image of George Armstrong Custer and a short biography are features of this history mug. This Thomas Custer mug is part of our collection of Civil War biographical mugs. 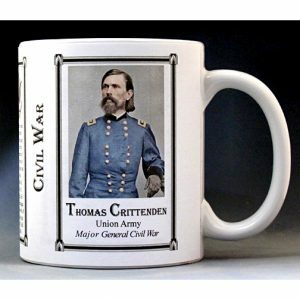 An image of Thomas Custer and a short biography are features of this history mug. The Thomas Custer mug is part of a biographical series profiling unique individuals and includes an image of Thomas Custer and a short biography. 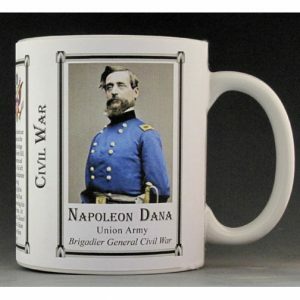 This Napoleon Dana mug is part of our collection of Civil War biographical mugs. An image of Napoleon Dana and a short biography are features of this history mug. 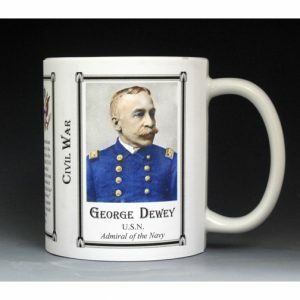 This George Davenport mug is part of our collection of Civil War biographical mugs. 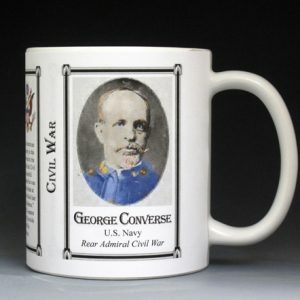 An image of George Davenport and a short biography are features of this history mug. This Jefferson Davis mug is part of our collection of Civil War biographical mugs. An image of Jefferson Davis and a short biography are features of this history mug. This Abner Doubleday mug is part of our collection of Civil War biographical mugs. An image of Abner Doubleday and a short biography are features of this history mug. This Frederick Douglass mug is part of a collection of our Civil War and African American biographical mugs. An image of Frederick Douglass and a short biography are features of this history mug. 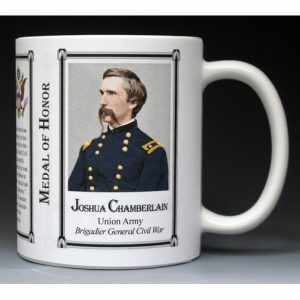 This Jubal Early mug is part of our collection of Civil War biographical mugs. An image of Jubal Early and a short biography are features of this history mug. This Sarah Edmonds mug is part of our collection of Civil War biographical mugs. An image of Sarah Edmonds and a short biography are features of this history mug. This John Ericsson mug is part of our collection of Civil War biographical mugs. An image of John Ericsson and a short biography are features of this history mug.